Sidebar: Smokers stink. I mean really stink. And it doesn’t matter if you smoke outside, wash your hands & brush your teeth. You still stink. Only I can say this since I’m just barely a non-smoker….anybody who has never smoked really shouldn’t say this ’cause a smoker will knock you out. I know…’cause I would have…5 weeks & 3 days ago. But I digress. So I quit smoking and now I’ve set my mind to running. I know, I know. I’m 43, have 2 herniated disks & torn ligaments in my back…and smoked for “umpteen” years. But none the less, I want to run. I want to be one of those people that run, not because I have to….but because I really enjoy it. And I won’t deny that I really think some of those running clothes are cute as all get out! Plus my “parts” will regain the shape and location that they were meant to have…and that’s all I’m going to say about that! If you know anything about me, you will not be surprised to hear that I turned to the ol’ “www” to learn whatever I could about anything remotely related to the art of running. And that’s where I found my new hero. 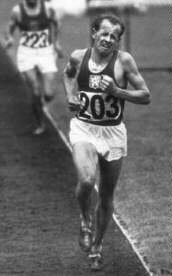 Emil Zatopek. In 1952, Emil Zatopek participated in the Helsinki Olympics & won 3 events – one was a marathon….and get this….he had NEVER run a marathon before. Now come on…how cool is that? And as if that was not enough, the man did all of this against the wishes of his doctor. You see, Emil Zatopek refused to let obstacles stop him. He paid no mind to “the odds” or “the experts” but simply listened to his heart. That’s why he’s my hero. He reminds me not to listen to that little voice in my head that says “You can’t do this, are you insane?” And to ignore those polite smiles that people give me when I tell them that I want to become a runner….or even worse, the outright belly-laughs I get from others. I will simply run. And when I do manage to enter my first 5K, I will have my placard mounted in a shadow box and display it in a prominent place. Not for the world to see….but for ME to see. I vow to learn how to use my magnificent motor…and to never give up….no matter what.